Russian Supreme Court upholds Navalny brothers’ sentence in Yves Rocher case | Russian Legal Information Agency (RAPSI). MOSCOW, April 25 (RAPSI) – The Supreme Court’s Presidium on Wednesday upheld the sentence given to Russian opposition politician Alexey Navalny and his brother Oleg in the Yves Rocher embezzlement case, RAPSI reported from the courtroom. During the hearing Deputy Prosecutor General Vladimir Malinovsky said that the European Court of Human Rights (ECHR) had not examined all case papers when hearing Navalny’s complaint. Moreover, enforcement of domestic law does not fall within the competence of ECHR, he added. Navalny filed a motion with the Supreme Court of Russia asking it to comply with a ruling of the European Court of Human Rights and release his brother Oleg from prison in March following the Grand Chamber’s refusal to reconsider the case. In October 2017, the European Court of Human Rights held that there was violation of Article 6 (Right to a fair trial) and Article 7 (No punishment without law) of the European Convention on Human Rights (Convention) in this case. 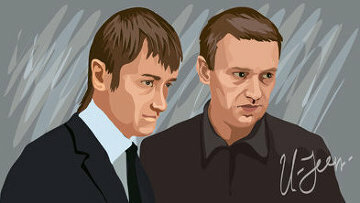 However, the ECHR refused to recognize criminal prosecution of the Navalny brothers as politically motivated by declaring their complaints “under Article 18 in conjunction with Articles 6 and 7 of the Convention inadmissible”. The court ordered Russia to pay €55,000 to Alexey Navalny in compensation. Oleg Navalny was awarded about €21,000 and 460,000 rubles. Both parties appealed the ECHR ruling. However, in March 2018, the court refused to send the case to the Grand Chamber for review. In December 2014, Navalny was given a 3.5-year suspended sentence in the Yves Rocher case. His brother Oleg received a 3.5-year prison term. They were convicted of stealing nearly 30 million rubles (about $500,000 at the current exchange rate) from two companies, including Russian affiliate of Yves Rocher. The term of Oleg Navalny is to expire on June 30, 2018. 12:22 25/04/2018 The Supreme Court’s Presidium on Wednesday upheld the sentence given to Russian opposition politician Alexey Navalny and his brother Oleg in the Yves Rocher embezzlement case.